The average American family washes almost 400 loads of laundry each year. It's a good thing families can cut their related energy costs by about a third - and the water costs by more than half - just by purchasing a clothes washer with the ENERGY STAR label. Over the life of your new ENERGY STAR qualified washer, you'll save enough money in operating costs to pay for the matching dryer. With your water savings, you could fill three backyard swimming pools. Is your washer over 10 years old? Replace it with a new ENERGY STAR qualified washer and you could save $135 each year on your utility bills. That's like getting your High Efficiency (HE) detergent free year round. This label helps you determine how much energy it takes to operate the model, compare the energy use of similar models, and estimate annual operating costs. 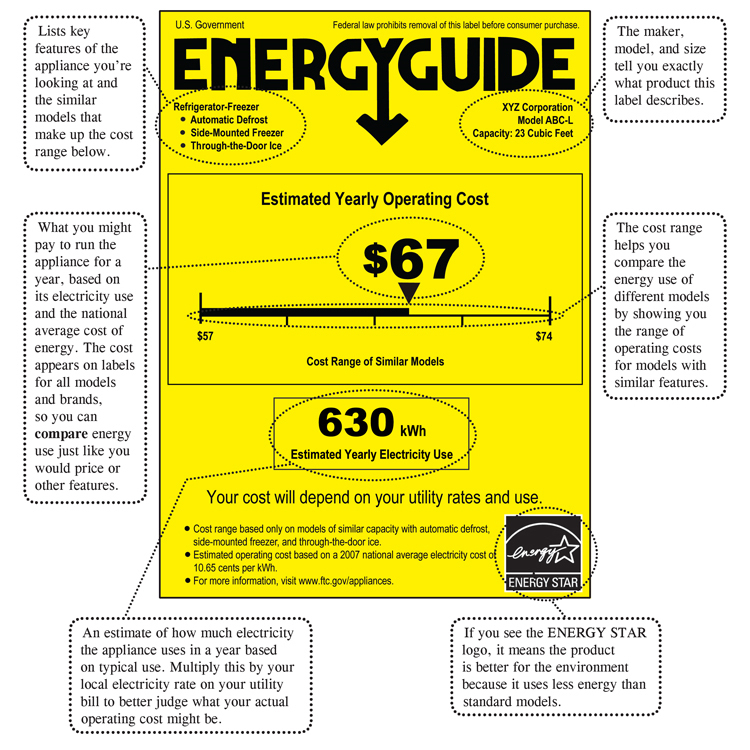 Learn How to Use the EnergyGuide Label. Think carefully about the size. While a larger model will obviously hold more clothes, it will also use more energy. On the other hand, a model that's too small will require a lot more clothes washing. ENERGY STAR qualified models are also available in stackable and under-the-counter designs, which fit in smaller spaces. 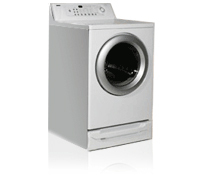 Choose a dryer with a moisture sensor. While ENERGY STAR does not label dryers, you can reduce your dryer's energy use by choosing a model with a moisture sensor. This feature automatically shuts off the machine when clothes are dry, which saves energy and reduces wear and tear on your clothes caused by over-drying. Choose a model with a high Modified Energy Factor (MEF) and a low Water Factor (WF). Modified Energy Factor (MEF) is a measure of energy efficiency that considers the energy used by the washer, the energy used to heat the water, and the energy used to run the dryer. The higher the MEF, the more energy efficient the clothes washer. Water Factor (WF) measures water efficiency in gallons of water consumed per cubic foot of capacity. The lower the WF, the more water efficient the clothes washer. Both MEF and WF are listed on the ENERGY STAR qualified product list. ENERGY STAR qualified dishwashers use advanced technology to get your dishes clean while using less water and energy. 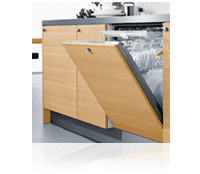 Trim your utility bills - Do you have a dishwasher made before 1994? 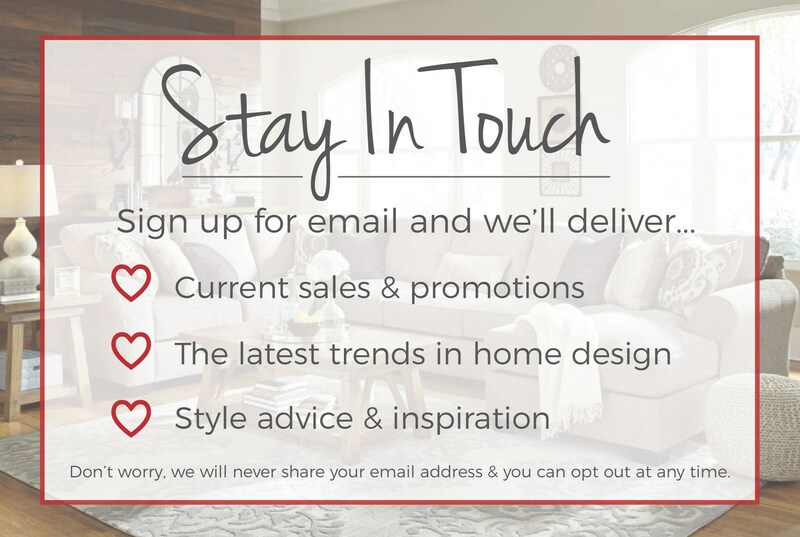 If so, you're paying an extra $40 a year on your utility bills compared to owning a new ENERGY STAR qualified model. Replace one of these old dishwashers with ENERGY STAR and save enough money to pay for dishwasher detergent all year. Save loads of water - A dishwasher built before 1994 wastes more than 10 gallons of water per cycle compared to owning a new ENERGY STAR qualified model. Replace one of these old dishwashers with ENERGY STAR and save enough water each week to wash 3 loads of laundry in an ENERGY STAR qualified clothes washer. Save the environment - Nearly 70 percent of U.S. electricity is generated by burning coal and natural gas, which releases greenhouse gasses and other air pollutants into the atmosphere, contributing to climate change and air quality problems. ENERGY STAR qualified dishwashers use less energy than conventional models, which helps reduce air pollution and combat global climate change. By reducing water consumption, ENERGY STAR qualified dishwashers also help protect our lakes, streams, and oceans. Improvements in insulation and compressors mean today's freezers consume much less energy than older models. Select an ENERGY STAR qualified freezer for maximum energy savings and the latest features. An ENERGY STAR qualified freezer uses 10% less energy than a new, non-ENERGY STAR qualified model. The older the freezer, the higher your bills. If you purchased your freezer before 1993, it is costing you an extra $35 each year on your utility bills compared to a new ENERGY STAR qualified model. If you bought it in the 1980s, it's costing you an extra $70 each year. Nearly 70 percent of U.S. electricity is generated with coal and natural gas, which release greenhouse gasses into the atmosphere and contribute to global warming. ENERGY STAR qualified freezers use less energy and help us reduce our impact on the environment. What else should I look for when buying a freezer? Ask for an ENERGY STAR model. When buying a freezer from a retailer, request an ENERGY STAR qualified model to be sure it's energy efficient. Use this label to determine the model's energy use, compare the energy use of similar models, and estimate annual operating costs. Purchase an appropriately sized freezer. Generally, the larger the freezer, the greater the energy consumption. Also, consider whether an upright or chest freezer better meets your needs. An upright freezer has a front-mounted door like a refrigerator and shelves that allow for easy organization. While a chest freezer typically requires more floor space, it's usually more energy efficient, since the door opens from the top and allows less cold air to escape. Consider a manual defrost model. Thanks to recent improvements in insulation and compressors, today's refrigerators use much less energy than older models. With an ENERGY STAR qualified refrigerator, you can maximize your energy and dollar savings without sacrificing the features you want. ENERGY STAR qualified refrigerators are required to use 20% less energy than models not labeled with the ENERGY STAR logo. Choose a new qualified model rather than a non-qualified model and cut your energy bills by $165 over the lifetime of your fridge. If you still have a fridge from the 1980s, replace it with an ENERGY STAR qualified model and save over $100 each year on your utility bills. 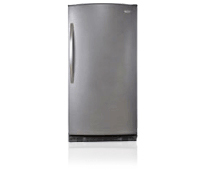 Replace a fridge from the 1970s and save more than $200 each year! Nearly 70% of U.S. electricity is generated with coal and natural gas, which release greenhouse gasses into the atmosphere and contribute to climate change. 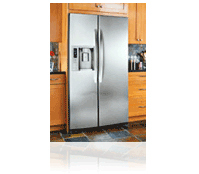 ENERGY STAR qualified refrigerators use less energy and help us reduce our impact on the environment. 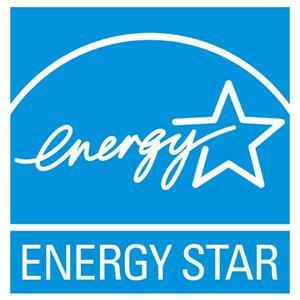 When buying a refrigerator, request an ENERGY STAR qualified model to ensure it is energy efficient. Models with top-mounted freezers use 10–25% less energy than bottom-mount or side-by-side models. Generally, the larger the refrigerator, the greater the energy consumption. The most energy-efficient models are typically 16–20 cubic feet. Consider skipping the ice-maker and dispenser. Automatic ice-makers and through-the-door dispensers increase energy use by 14–20%. They also raise the purchase price by $75–250.